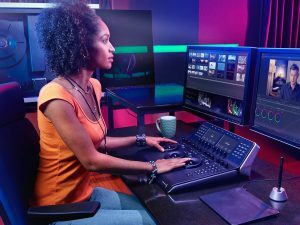 Blackmagic Design announced ATEM Constellation 8K a major new high end live production switcher with 8K capability that lets customers create content for the next generation of the television industry. ATEM Constellation is available now from Blackmagic Design resellers worldwide for US $9,995. The new ATEM Constellation 8K is an Ultra HD live production switcher with so many features, customers can combine them all to make an incredibly powerful 8K switcher. Customers get 4 M/Es, 40 x 12G-SDI aux outputs, 4 DVEs, 16 Keyers, 4 media players, 4 multi viewers, 2 SuperSource and standards conversion on every SDI input. Then when switched to 8K, all these features combine to make a powerful 8K switcher. 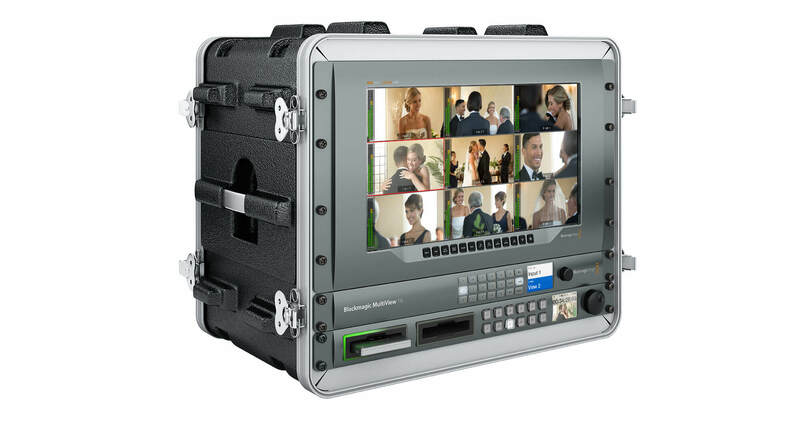 ATEM Constellation 8K features a compact 2RU rack mount design with a built in control panel. This allows operation of the switcher, critical during setup for emergency use. Also included is a large LCD so customers can see program output and change switcher settings via on screen menus. Although only 2RU size, the rear of the switcher has a massive 40 x 12G-SDI inputs, 2 x 12G-SDI aux outputs, plus balanced audio, Ethernet, RS-422 control and MADI digital audio extra inputs to the internal Fairlight audio mixer. With a built in control panel, customers can simply walk up and take full control of the ATEM Constellation at any time. Customers get incredible power with both PGM/PVV or cut-bus style operation. The buttons are the same premium type used on full sized panels, and allow control of transitions, upstream/downstream keyers, media players and fade to black. But users are never limited, as the LCD menus also allow every single operational feature of the switcher to be accessed. Customers get 40 independent 12G-SDI inputs, each with input featuring its own dedicated up and cross converter. That means it’s possible to convert 1080p and Ultra HD sources to stunning 8K to use them in their 8K programs. When used in Ultra HD, customers can connect up to 40 different sources in all formats up to 2160p60. When running 8K formats, connect 10 Quad Link 12G-SDI 8K sources in all formats up to 4320p60. Visit Blackmagic Design at NAB 2019 booth #SL216. 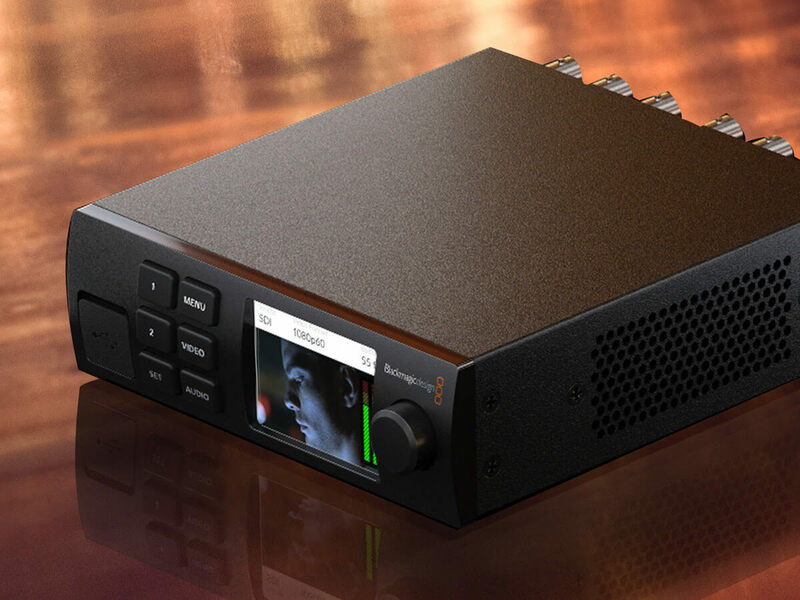 Blackmagic Design has introduced the UltraStudio HD Mini, the world’s first portable Thunderbolt 3 capture and playback solution designed for archiving, edit monitoring, streaming, and live broadcast graphics. UltraStudio HD Mini is in stock and available now from Blackmagic Design resellers worldwide for $495. Blackmagic Design took a different direction with UltraStudio HD Mini, by including some new connections that people needed, and removing ones that people don’t use anymore (like analog out). People are capturing from older analog and digital broadcast decks for archiving content to modern digital media files. People also want to run live graphics into switcher with fill and key and of course, we often need to get high quality monitoring in HDMI and SDI when editing and color grading and need perfect AV sync. It also works with Open Broadcaster software for 1080p streaming. UltraStudio HD Mini has been designed to do those tasks well. Blackmagic Design fit it all into the small Teranex Mini sized design. It is Thunderbolt powered so you don’t need to connect it to a power supply. You can power it from your laptop battery. If you add the optional Teranex Mini Smart Panel you also get video, audio meters and status, including a new frame buffer indicator to assist in evaluating disk performance on broadcast systems. You can also rack mount multiple units using the Teranex Mini Rack Shelf. The optional Teranex Mini Smart Panel is $85. UltraStudio HD Mini features professional broadcast quality connections that include 3G-SDI, analog YUV and composite NTSC/PAL video inputs, along with a reference input. There are also two 1/4” audio connections for analog audio input that work with balanced HiFi sources. In addition, UltraStudio HD Mini can remote control professional broadcast decks using the built in RS-422 connection. For output, you get dual link 3G-SDI with fill and key, and an HDMI connection for monitoring video with a big screen television. 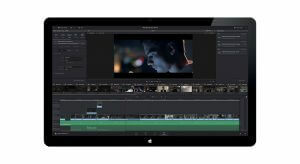 Blackmagic Design recently announced DaVinci Resolve 14. It is a dramatic upgrade that is the biggest release in the history of the software. There is currently a public beta for DaVinci Resolve 14 that can be downloaded from the Blackmagic Design website for free. The DaVinci Resolve 14 update was designed to solve some of the bigger problems in post production. The first problem was performance. They have made some dramatic performance gains and DaVinci Resolve 14 is now up to 10 times faster than the previous release. It’s very fluid and much more responsive. With DaVinci Resolve 14, they have built in Farlight audio on its own new page in the software. It’s incredibly powerful and can play back up to 1,000 tracks with parametric EQ, dynamics and plug ins on every track, all in real time, when used with the Fairlight Audio Accelerator card. It’s also very powerful when run on a stock computer system as well. Because audio for film and television is a lot more complex, Blackmagic Design thinks integrating it into DaVinci Resolve will make it fast and easy. It’s just a button click away. Plus, it works with the full sized Farlight consoles so it makes an amazing combination. To make this workflow really fast, you want people to be able to edit, color and do audio post production all working together, on the same job at the same time. To make this easy, DaVinci Resolve 14 now integrates extremely powerful collaboration tools to make that easy. With editing, advanced color correction and these new Farlight audio tools, DaVinci Resolve 14 is like getting 3 high end applications in one. The performance improvements and new audio features are built into the free DaVinci Resolve software you can download for free. However, the new collaboration tools and some of the plug ins are only available in the paid DaVinci Resolve Studio. Blackmagic Design has now reduced the price if the full DaVinci Resolve Studio to $299 so that it is much more affordable. It can be purchased on the BlackMagic website. Blackmagic Design announced an exciting new low price on SmartView 4K and SmartView HD broadcast monitors. The SmartView 4K is the world’s first full resolution Ultra-HD broadcast monitor with 12G-SDI inputs and has now been reduced in price to only $995, while the high definition SmartView HD is only $795. The fast adoption and incredible excitement behind Ultra HD technology means that the component costs have been drastically improved over the last few months and these reductions can now be passed on to customers. This has allowed Blackmagic Design to dramatically lower the prices of the SmartView 4K from $1,995 to only $995. SmartView 4K is a professional Ultra HD broadcast monitor with a native resolution of 3840 x 2160, an amazingly bright LCD screen with a wide viewing angle and advanced broadcast features such as 3D LUTs, adjustable screen markers, H/V delay, blue only and more. SmartView 4K features multi rate 12G-SDI inputs that automatically switch between SD, HD and Ultra HD formats up to 2160p60. With 12G-SDI, SmartView 4K is an incredibly future proof design with unprecedented full resolution Ultra HD high frame rate support all built into the attractive thin rack mount design. When monitoring SD, 720 HD or 1080 HD SDI sources, the built in Teranex processor uses advanced patented and proprietary PixelMotion algorithms to automatically de-interlace and scale video to the native Ultra HD resolution of the LCD. This means customers get visually transparent, artifact free scaling for the best possible quality and a fluid, smooth viewing experience. The 6 rack unit size machined metal design of of SmartView 4K features a built in control panel for access to advanced features such as built in 3D LUTs, H/V delay, blue only for checking hue and image noise and customizable frame markers. The machined metal design also has a metal internal chassis allowing VESA mounting points on the rear so the monitor can be rack mounted, or mounted on articulated arms similar to computer monitors. This allows installation in news rooms, walls, and other non rack mount locations. SmartView 4K is available for $95 and SmartView HD is available for $795. Both monitors are available now from Blackmagic Design resellers worldwide. Blackmagic Design announced a major new camera operating system for its URSA mini cameras. This new camera OS features an incredible new user interface along with dozens of new features. Blackmagic Design demonstrated the new URSA Mini camera OS beta at NAB 2016. The new URSA Mini camera OS is not just an upgrade, it’s a total rewrite from the ground up. The new OS has been specifically designed for the high performance processing architecture of URSA Mini and delivers a much more responsive experience, along with an entirely new user interface that makes using the URSA Mini faster and more intuitive than ever before. The first things customers will notice is the incredible new user interface and heads up display which dramatically reduces the number of menus and submenus needed to find specific settings and commands. Customers can now quickly change settings such as ISO, white balance, shutter angle, iris, frame rate, frame guides and more without ever having to navigate through any menus. In addition, there are now custom white balance and white balance presets, along with tint control settings. Customers also get more accurate shutter angle selection, including a large easy to use on screen keyboard for easy entry of settings. When entering the shutter angle, the new URSA Mini camera OS will even offer smart flicker free shutter angle suggestions to the camera operator. Entering metadata on cameras has always been tedious. The new URSA Mini camera OS solves the problem of tedious metadata entry by giving customers an entirely new metadata entry page with predictive entry suggestions and a preloaded dictionary of commonly used terms that can be applied as metadata tags with a simple tap. 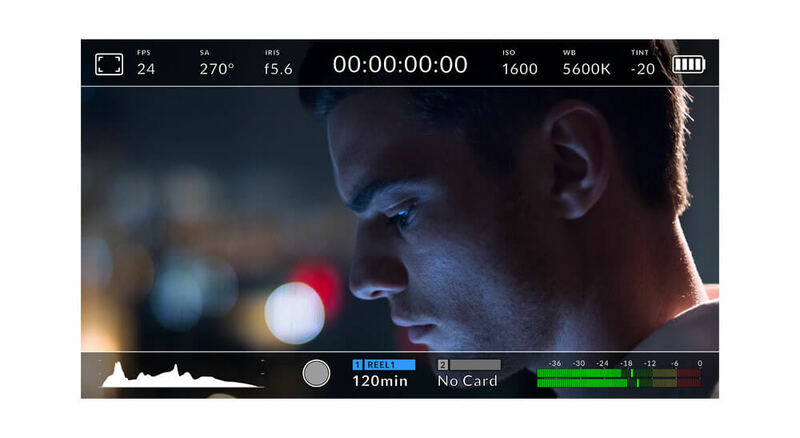 The new URSA Mini camera OS adds 1.33x and 2x anamorphic de-squeeze previews, along with the ability to double tap so customers can pan and zoom around the preview on the built in display. Customers can now import and store external 3D LUTs and apply the LUT to the LCD, and front and main SDI outputs independently. They can also load and save their own presets for different shooting setups or different operators. In addition, customers can now assign shortcuts to camera function keys, toggle between peaking and color focus assist, see new percentage based safe area guides and have the ability to toggle SDI overlays with information specifically geared toward either the cinematographer or the director viewing at video village. The Blackmagic URSA Mini camera OS will be available later this year as a free update for all Blackmagic URSA Mini customers. The URSA Mini camera OS beta was demonstrated at booth SL217 at NAB 2016. Blackmagic Design announced Desktop Video 10.6.4. Update which adds support for HDR playback over HDMI to UltraStudio 4K Extreme and DeckLink 4K Extreme 12G. Blackmagic Design demonstrated Desktop Video 10.6.4 at NAB 2016. Desktop Video 10.6.4 Update adds playback support for HDR content over HDMI to UltraStudio 4K Extreme and DeckLink 4K Extreme 12G. The new HDR features include HDR metadata transport and support for the Rec. 2020 color space over HDMI. This means customers now get full support for monitoring on HDR capable displays using a single HDMI cable, making it ideal for editor and colorists working on HDR projects with DaVinci Resolve 12.5. HDR, which stands for high dynamic range, is part of the new Ultra HD Premium standard so customers can now get big screen, low cost consumer televisions that support a massive range of color, peak brightness of up to 1,000 nits, which is 10 times brighter than most HDTVs, and incredible contrast ratio. This means that colorists and editors working in DaVinci Resolve 12.5 with UltraStudio 4K Extreme or DeckLink 4K Extreme 12G will now be able to monitor images that are more true to life and more closely resemble the color and dynamic range of the latest cinema technology. Desktop Video 10.6.4 Update is now available for free download from the Blackmagic Design website. Blackmagic Design demonstrated the Desktop Video 10.6.4 Update at booth SL217 at NAB 2016. Blackmagic Design introduced two new, super small, broadcast quality video converters at NAB 2016. They are the Blackmagic Micro Converter SDI to HDMI and the Blackmagic Micro Converter HDMI to SDI. Both were demonstrated at NAB 2016. 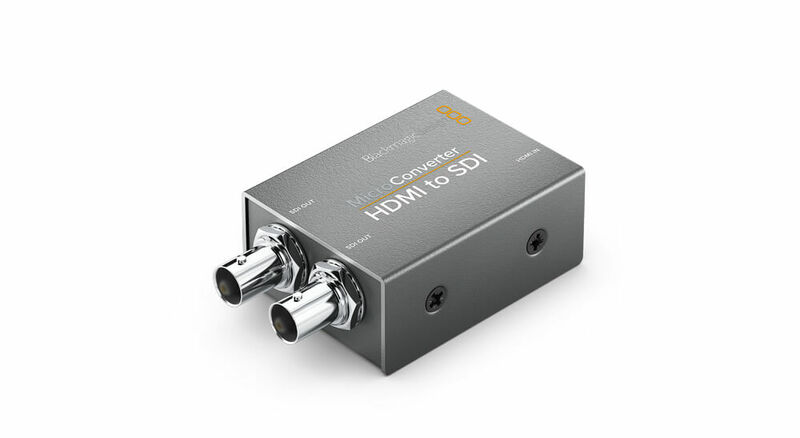 The Blackmagic Micro Converter SDI to HDMI converts signals from professional broadcast equipment such as cameras, decks, switchers and routers, and converts it into HDMI so customers can monitor video using big screen televisions and projectors. The Blackmagic Micro Converter HDMI to SDI model lets customers connect their HDMI equipment, such as laptop computers, gaming consoles, and consumer video cameras, to professional broadcast equipment. Both models feature full size HDMI and professional 3G-SDI connections with all SD and HD formats up to 1080p60. Unlike other small video converters, Blackmagic Micro Converters feature the highest quality broadcast technology, miniaturized into a proper metal enclosure. 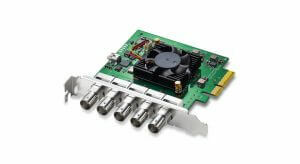 Customers get the same broadcast quality 10-bit video processing found in full size converters. In addition, Blackmagic Micro Converters also have SDI re-clocking on the 3G-SDI input which regenerates the SDI video input, reduces SDI jitter and improves SDI eye pattern before the signal is processed. This allows longer cable lengths and makes them incredibly reliable for use in professional broadcast. 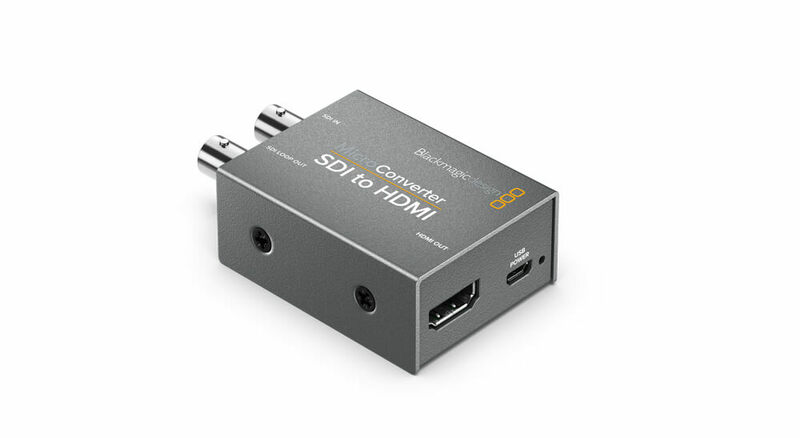 Blackmagic Micro Converters are powered via the same micro USB connection that’s used on smartphones so consumers can use the included DC plug pack, any USB device, or even a smartphone charger to power to converters. The included external power supply supports 110 to 240V AC and comes with 4 different AC socket adapters so customers can plug them into outlets anywhere in the world. That means they can be run from the external power supply, or even over USB from things such as big screen televisions or laptop computers if there are no AC wall outlets available. Blackmagic Micro Converters are available now for US $85 from Blackmagic Design resellers worldwide. Both models are being demonstrated at booth SL217 at NAB 2016. Blackmagic Design announced DeckLink Duo 2, a new high performance capture and playback solution with 4 independent channels that can be assigned to either record or playback in any combination, all on a single plug in PCI Express card. Blackmagic Design demonstrated the DeckLink Duo 2 at NAB 2016. Designed for developers and OEMs, DeckLink Duo 2 is the idea solution for media play-out servers, multi screen digital signage servers, real time processors and more. The new model DeckLink Duo 2 features 4 independent 3G-SDI connections so it can now work in high HD frame rates and it supports SDI formats in SD and HD up to 1080p60. Each SDI connection is completely independent, meaning that each of the 4 connections can input or output entirely different video standards and content streams, all at the same time. DeckLink Duo 2 can also capture and develop playback at the same time, and also includes a reference connection for black burst/tri-sync. Developers can use the SDK to configure the four SDI connections to be any combination of inputs and outputs. Featuring high performance 4 lane Generation 2 PCI Express, DeckLink Duo 2 takes up only one single PCI slot in the computer, which makes it the perfect solution for system integrators and developers that need completely customizable, flexible, I/O configurations on a single card. The DeckLink Duo 2 appears as 4 independent SDI cards to the host computer, even though it only uses a single PCI Express slot and is ideal for use in servers that need to handle multiple video streams for both simultaneous capture and playback. The DeckLink Duo 2 is available now for US $495 from all Blackmagic Design resellers worldwide. Blackmagic Design is demonstrating the DeckLink Duo 2 at booth SL217 at NAB 2016. Blackmagic Design has announced the availability for immediate download of the public beta for DaVinci Resolve 12.5. It was designed to make it easier for professional editors and colorists to work faster and have more creative options than ever before. Blackmagic Design demonstrated it at NAB 2016. DaVinci Resolve 12.5 is a massive update with over 1,000 enhancements and 250 new features which includes major additions to the editing toolset, new and enhanced color features, including improved HDR support, and powerful new effects. DaVinci Resolve 12.5 adds dozens of new editing and trimming features such as the new swap and shuffle edits, seven entirely new trim operations, paste inserts, an expanded edit overlay with ripple overwrites and append edits, and much more. In addition, timeline performance has been greatly improved so editing is faster and the new Camera Viewer option plays video full screen, making it easier for customers to preview their cut on laptops or systems with a single display. DaVinci Resolve 12.5 introduces an entirely new way to navigate clips using audio waveforms. The source view features a revolutionary audio waveform overlay that allows you to see the audio waveform and video clip at the same time. This is the fastest way to navigate to different parts of a clip based on spikes, silent areas, or other visual cues in the audio waveform. A new metadata keyword dictionary makes it easier to choose common or previously created keywords and quickly apply them to clips. Metadata can now also be imported or exported via CSV files. Media Pool metadata columns can also be customized and saved, colors can be assigned to specific clips, and markers can now be single frame or durational. Display names, which hare used throughout the software, can be automatically created based on metadata tags such as scene, shot, and take information, saving editors hours when importing and working with large amounts of footage. New Power Bins in the Media Pool allow sharing of content between projects, making them perfect for graphics, stock footage, and sound effect or music libraries that are used across multiple projects. The timeline curve editor has been improved so customers can now select, move, and edit groups of multiple keyframes at the same time. There are also new visual controls for adding or selecting keyframes, as well as a menu for selecting parameters and curves to edit. For colorists, DaVinci Resolve 12.5 introduces major enhancements to the node editor so now it’s possible to quickly navigate between nodes, swap nodes, select multiple nodes with a lasso, copy node contents, extract nodes, use embedded alpha channels in mattes and more. When dragging a saved grade from the gallery, customers now have the option to drag the grade in as a single compound node or as a fully expanded node tree. The public beta of DaVinci Resolve 12.5 and DaVinci Resolve 12.5 Studio are now available for download from the Blackmagic Design website free of charge for all current DaVinci Resolve customers. Blackmagic Design has been demonstrating it at booth SL217 at NAB 2016. 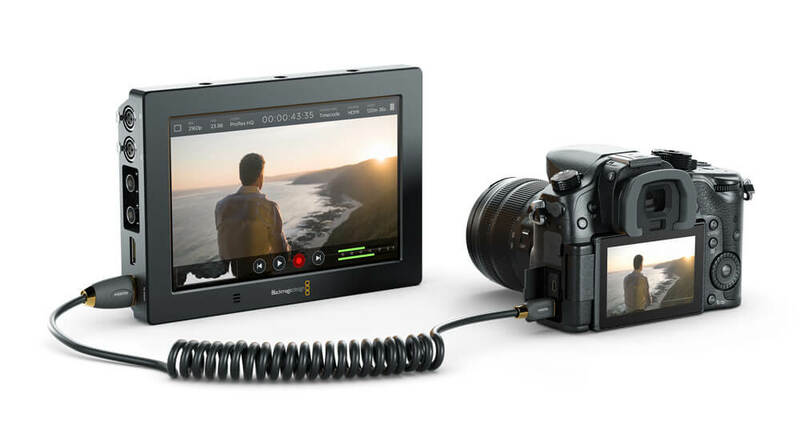 Blackmagic Design announced Blackmagic Video Assist 4K, a portable all in one professional monitor and video recorder that can be used to add professional recording and monitoring to any SDI or HDMI camera. They will be demonstrating it at NAB 2016. Blackmagic Video Assist 4K features a bright, high resolution 7 inch monitor for checking focus and framing, two high speed recorders for non-stop HD and Ultra HD recording, two extremely high quality XLR microphone inputs for professional audio recording, a built in speaker, and more. The Blackmagic Video Assist 4K is perfect for customers that need better monitoring and higher quality recording. It works with every type of camera from DSLRs to older tape based camcorders, and even the latest digital film cameras. Blackmagic Video Assist 4K features two built in high speed UHS-II recorders that work with the latest high performance SD cards, making them fast enough to record Ultra HD video up to 2160p30 on widely available, inexpensive, SD cards. Files are saved as broadcast quality 10-bit 4:2:2 video in either ProRes or DNxHD formats, making them compatible with all popular editing software. 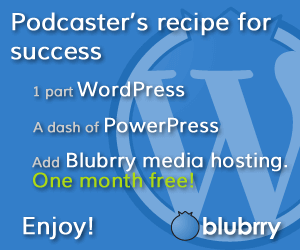 You can start editing immediately without having to transcode or convert files. Recording can be triggered to start and stop using LANC or over HDMI or SDI from the camera. With two built in recorders, customers get non-stop recording because when one card is full it automatically continues onto the next. The new high speed SD cards are compatible with existing SD card readers so they can be mounted directly on a computer for cloning and backup using the DaVinci Resolve software. Blackmagic Video Assist 4K features two mini XLR inputs with 48V of phantom power so customers can attach external microphones. 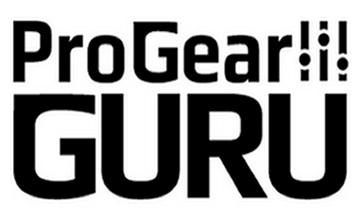 This totally eliminates the problems with auto gain controls on DSLR cameras. Sound is recorded into the same file as the audio, so customers don’t have to worry about AV sync between separate audio and video files. The Blackmagic Video Assist 4K features a bright, 7 inch high resolution 1920 x 1200 monitor and touchscreen with a wide 135° viewing angle. The extra resolution of the screen lets customers view 16:9 sources and see critical status information without covering the image. The display is also a touchscreen that lets customers tap and swipe gestures to display camera information, change settings and evaluate audio and video levels. For power, Blackmagic Video Assist 4K features two standard LP-E6 battery slot that allow hot swapping of batteries while in use, and it can be powered using the 12V DC input. The batteries are discharged serially, so only 1 is used at a time. The Blackmagic Video Assist 4K is available now for US $895 and will be demonstrated at booth SL217 at NAB 2016.